Hello everyone!! We have another fun collaboration blog hop between My Sweet Petunia and Alexandra Renke. If you haven't heard or seen the wonderful products from Alexandra Renke, you are going to enjoy this blog hop! Amazing projects will be shared from both Design Teams and chances to win too! I have 3 projects for you today! Super fun stamps and dies! 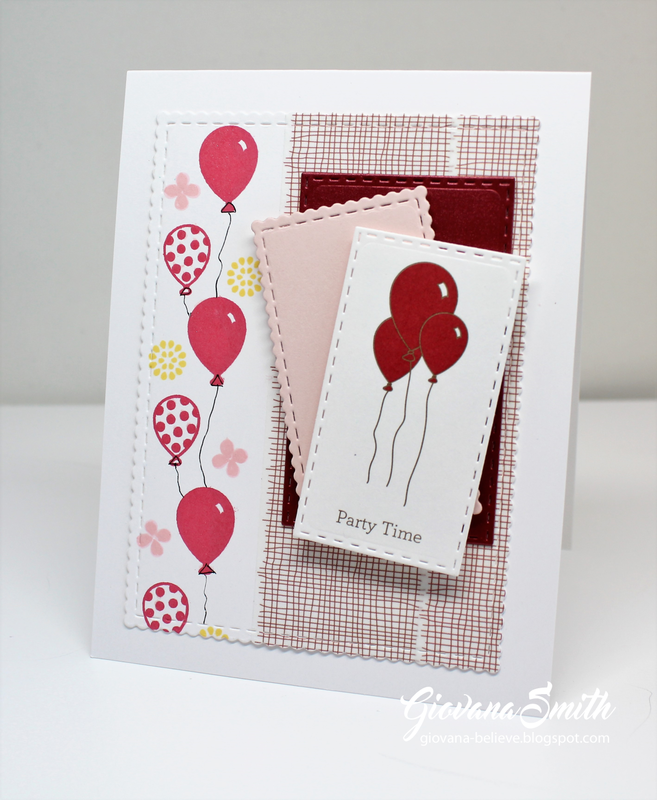 For this project I started stamping the balloons and flowers from "Baby Rocker" clear set on a piece of white cardstock, then added a couple of strips of Rust Chequered Washi Tape , then die-cut the panel. Then, I die-cut one of the little images from this super cute "Card Sheet Stuffed Animals"design paper, just added a couple of die-cut pieces from pink and red cardstock. Super simple card, but cute at the same time. 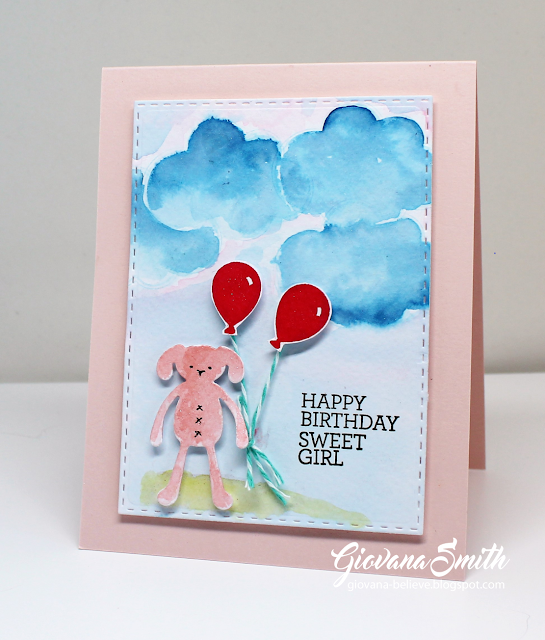 For this card I started stamping the cloud, several times, from "Baby Rocker" clear stamp on a piece of watercolor piece of paper in Broken China Distress Ink, then colored them with Faded Jean Distress Inks and Blue Sparkle Marker. After it dried, I stamped the sentiment from "Best Wishes" Clear set in Stazon Ganache ink. 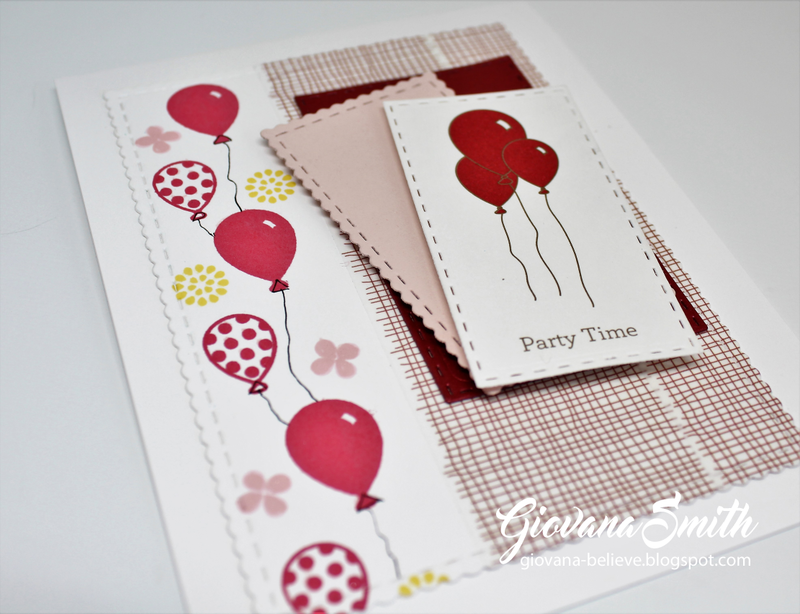 Then I stamped the balloons on white cardstock in red ink and cut them out. Finally, I die-cut the bunny from Caboodle Die Set, then colored it with Pink Sparkle marker. Added the panel to a pink card base. I started cutting a piece of "Baby Rattle Gold" design paper, 5.5" x 5.5", then I die-cut a square window in the middle of the paper. Die-cut a frame, added foam tape underneath and adhered it to the design paper. Die-cut the animals from Caboodle Die Set using watercolor paper, then sponged them with Distress inks. Added the die-cuts behind the window. Added tulle and ribbon to create the curtains. Added a piece of wood paper behind, then added the panel to the 6" square white card base. 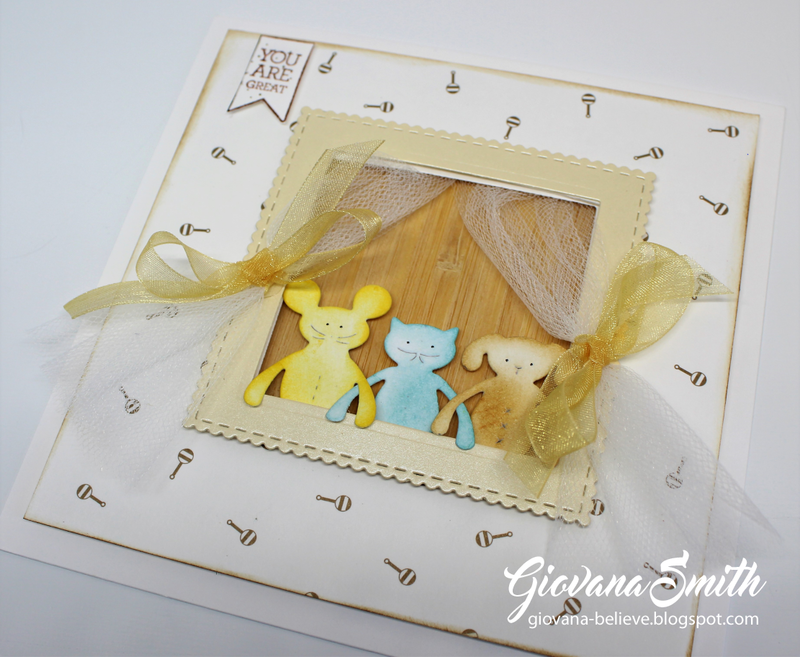 Stamped the banner and sentiment from "Best Wishes" clear set on a little piece from one of the design papers. To qualify for the giveaway, you just need to leave a comment on the participant blogs no later than Sunday, June 17th at 11:59 PM Central Time. 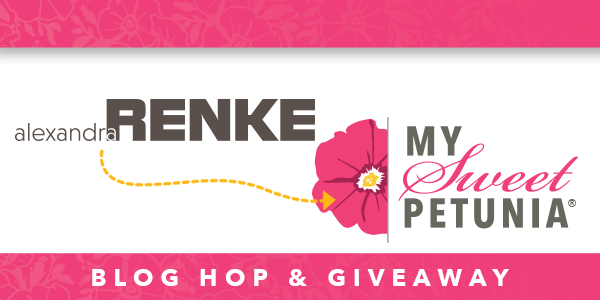 Winners will be announced on Tuesday, June 19th on the Alexandra Renke and My Sweet Petunia blogs. Those balloons are so cute ... fabulous designs. Love your cards Giovana ... that top one though, tickles me! I love that bunny! Adorable cards. Those little animals are just so sweet and unusual. Three wonderful cards. Love the window one! What cute cards...so much fun! card are genius of you! Super sweet. Great cards and I love these little animals. Such fun card designs and I love the balloons too. So darling and so so sweet! You’ve made such a cute trio of cards !! And they’re all also very delicate. Fabulous cards! I really love the animal dies! 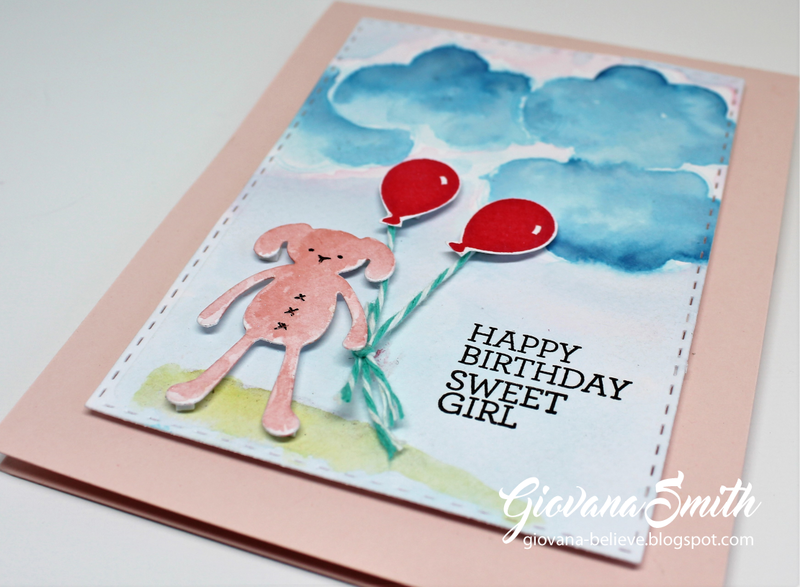 Fantastically fun, sweet and happy cards! Cute cards, love the curtains!! ADORABLE cards! I really like the curtains that you made for the 3rd card! with the cute little animals peeking through! Just so precious! Very cute cards! I especially love the little curtains you created on the last one! Beaucoup de gaieté dans ces cartes, la dernière est ma préférée avec sa mise en scène façon théâtre ! Really great designs. Love the animals. All so cute. I like the balloons, cute critters and the window. Impression Obsession Challenge: I sea you! Impression Obsession Challenge: Foodie Fun! Technique Junkies Stamps June Release is here!! !